Very striking heifer. 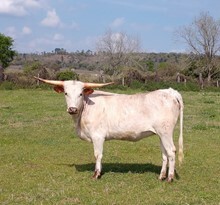 Her dam has an unusual sweep to her horns. Bred to Pearl Snap BCB for a winter calf. Millennium Futurity applies. Solid pedigree. Only a three year old with good horn growth. Nice bodied young cow. This will be her second calf. Pretty heifer out of the John Stockton/Susan Burton program. . She goes back to Tempter on the topside and Overhead on the bottom. Sells for $1200. A very well made heifer out of HL Lincoln. She's exposed to Pearl Snap BCB. If you like black and white, here she is! Offspring are Millennium Futurity eligible. Good natured! Check out her dam, HL Overtaken; she has 68.5 ttt, with a TON of total horn. Her sire, HL Loncoln was 76" in 2015. 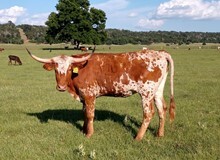 Consigned to the Hill Country Heritage Longhorn Sale on 9/9/16. Beautiful red heifer and it appears that her horns will twist out to a handle-bar shape like her dam's. Sells unexposed. 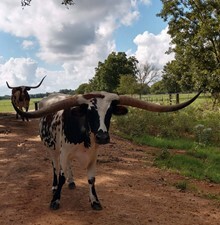 Beautiful young steer who is very gentle. Great horn growth for day of age. Mid 70's ttt. Good young black and white cow with a new baby bull at side out of Pearl Snap BCB 12/3/18. Very good disposition and good milker. All offspring are Millennium Futurity eligible. Good pair. Merry's dam was well over 70"ttt at the time she was sold. Very nice young female with a Big Red heifer at side born 9/19/18. Great pair. She's exposed back to Pearl Snap BCB and was witnessed breeding on 10/28/18. Heifer calf at side out of Annex born 5/27/18. Wonderful young female who is exposed to Pearl Snap BCB as of 8/13/18. Great genetics. 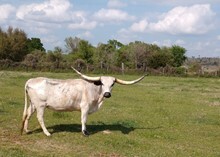 Big cow; estimated horn (since she broke one early in life) is 75.5" ttt. Raises nice calves and is a great milker. She's heavy bred and due any day! All offspring are eligible for Millennium Futurity. Her genetic package goes back to Phenomenon on top, Measles Super Ranger and Senator on bottom.